Now that Christmas and New Year is out of the way, our infrastructure team has started the work of moving all our customers across from the old ‘BOB’ grocery platform to the sparkling new ‘Project Martini’ service. The team just informed me that they’ve reached the 20% mark – which means that as a Tesco.com customer you now have a 1-in-5 chance of being on the new service today. 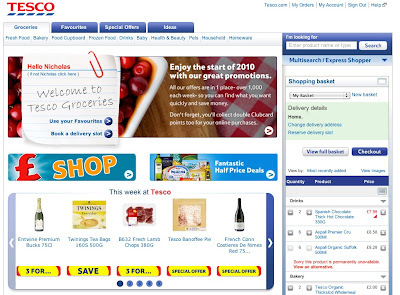 You can tell if you’ve been upgraded, because you’ll see the new home page as shown above when you next login to http://www.tesco.com/groceries. Don’t worry if you haven’t been upgraded yet; the aim is to have moved everyone over by the end of February – we’re just taking it step-by-step at the average rate of 3% a working day as we build up load on the new service. We’re using random factors in the decision-making being used as to which accounts are upgraded in each daily batch so there is no clue as to when your account will be actually transferred – and no unfairness just because your surname starts with an X, Y or Z…!